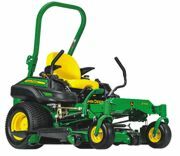 John Deere announced the addition of one new zero-turn mower and the expansion of an existing model. The new Z960M and expanded Z970R ZTrak™ mowers provide more solutions to meet today's demands. The Z960M provides a powerful, reliable machine at an affordable price. Boasting 31.0 HP, the Z960M is available in three deck offerings: 60-inch, 60-inch Mulch On Demand™ or 72-inch. The Z970R now features two additional deck options: 60-inch side discharge or 60-inch MOD. Humphrys-CoverSports introduces its 2016 full-color catalog, featuring a deep selection of popular products, many of which have enhancements for versatility and a longer life. A key theme of this year's catalog—The Power of Branding™—is an emphasis on the ability for imprinting customers' brands on gym floor covers, windscreens/banners, padding and field covers. During this era of tightening budgets, high schools, universities and more can protect walls, floors and fields with CoverSports protective covers and make an impact on their budget through sponsorship promotion. Coverworx Recreational Architecture is your complete source for shelter, shade and trellis canopies, offering nationwide, design, fabrication and installation. This "Umbrella" design allows for clean and stylish single-post coverage. Octagonal in shape with an array of sizes available, this Coverworx exclusive banded column design is just one example of the wide range of designs available through Coverworx. Lighting the interior of open-air shelters has many benefits, most notably improving shelter visibility and security. Poligon's solar lighting kit provides all materials required for the stand-alone illumination of shelters, including photovoltaic cell and mount, LED lamp unit, storage battery, lamp driver/battery controller, battery enclosure and required wiring. Poligon will also help configure your application based on location, roof pitch and availability of sunlight to provide consistent lighting year-round. The system can also be sized to meet lighting requirements for a variety of shelter sizes. Tetherball is making a comeback! In-ground outdoor tetherball systems from Bison offer long-lasting outdoor durability and include a 1 7/8-inch diameter galvanized steel pole, PVC ground sleeve for easy pole removal when not in use, rope attachment ring, and tetherball with rope. Portable systems include a steel base with 130# of built-in ballast and non-marking wheels, ball, rope and top ring. Replacement poles, ground sleeves and tetherball with rope and attachment clip can also be ordered. Playworld announced the launch of Branch Out, a large play component inspired by how children play in trees. Visually complex, Branch Out creates meaningful play experiences for children in an efficient, open layout that offers endless possibilities for post and platform playgrounds. The inclusive play component incorporates a variety of elements, including nets, ropes and flex treads to encourage complex vertical climbing, crawling, hanging and lying down at different heights. With Branch Out, children can observe and see play from any angle.